For those of your who have journeyed on with me, I’ll start with the book itself. The story is of Hazel Grace Lancaster who is dying of lung cancer, but has a little more time due to the success of a drug she is trialling. Hazel likes America’s Next Top Model, wears Chuck Taylors, loves her parents, has had to grow up very quickly and is currently 16. At her support group she meets Augustus Waters, a cancer survivor and a very handsome young man. She strikes up a friendship with Augustus and they bond over their scathing wit, their love of books and their mortality. The books reflections on the simple loves in life and of the profound sense of loss and losing those things you care about hits the reader hard. You don’t have to have cancer or know anyone who does to understand the crushing sense of loss when you imagine what it’s like to lose someone you love, to not be able to play, to suffer pain all the time. And similarly, you can understand the things that are so wonderful about life that we take for granted; a good meal, champagne, the sound of someone you love breathing steadily, the first time you see a new town, the memories of playing on an old swing set. Green has an ease of writing and a wonderful emotive way of storytelling. Throughout the book, on their journey together, falling in love, learning about life and limitations, about the importance of friendship, Augustus and Hazel teach us, make us reflect on what death means to us and to the people we care about, what life means, what we do with the time we have. They often reflect that life is not a wish granting factory. Life is unfair. Hazel lends Augustus her favourite book An Imperial Affliction, a book that she deeply connects with, and that he bonds with her over. The two of them embark on a trip to Amsterdam to meet the author, but the trip is more about them than it is about the book in the end. As most of the wonderful things in life, something is precious when it’s shared; when it helps you understand your life and allows you grow. An Imperial Affliction is really a means of Augustus and Hazel sharing each other while they have the chance. The fact that the author of An Imperial Affliction turns out to be such a disappointment is a very interesting development. Interesting because often the people we idolise the most are the best at disappointing us, and his life story is tragic as well, he didn’t have it all worked out, but that didn’t make his work any less important. He also, in his hateful ramblings, had many insights to offer both Hazel and the reader, and that is his gift throughout the novel. That makes him important. So important, that it’s to him that Augustus sends his attempt at Hazel’s eulogy, which he can no longer give. Yes, we spend most of the book watching these two young people fall in love and think that she is the sick one, the one who is going to leave him behind. As it turns out, he has a recurrence of his cancer and dies before Hazel. In fact, Hazel is still alive, living with this loss, when the story is over. It’s heartbreaking. Hazel and Augustus reminded me a lot of Veronica and Logan in Veronica Mars in many ways, sans the money and the sleuthing, and adding the disease. The grandiose talks, the perfectness in imperfection I think were what did it for me. Logan and Veronica were perfect for each other because they weren’t; they were just there at the right time doing the best that they could. Choosing who was allowed to love them and who was allowed to break them. The best loves probably are like this, without artificial boundaries and idealistic pressures. I think this was why I was drawn to Hazel and Augustus’ story, aside from brilliant writing, as Logan would say “No one writes songs about the ones that come easy”. Hazel and Augustus have it anything but easy, and they still give it a go, because experiencing what they do is better than not having it because they were too afraid. Their friendship with Isaac is also a cause for celebration in the book. The trio are fantastic, trying to live as best they can as teenagers with huge disability, discomfort and with a disease. 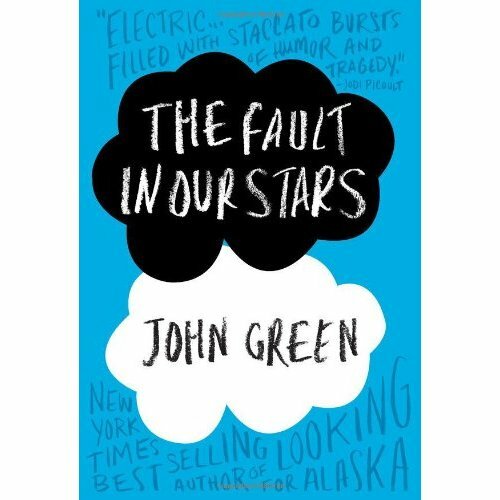 Isaac loses his sight to his cancer, and also his girlfriend... in the end he loses his best friend in Augustus. There is nothing happy in his story, and yet, his moments of complete humanity and teenage fuelled angst make him likeable and real, smashing trophies, trying to egg his ex-girlfriend’s car, death humour and moments where it’s clear how much Augustus means to him. I haven’t seen a trio like this since The Perks of Being a Wallflower’s Sam, Charlie and Patrick. It’s a joy to read. The first page of The Fault in Our Stars is a note from John Green. In this note he explicitly states that everything in the book is a work of fiction, there is no truth or basis on someone’s story in here and to look for it, takes away the very notion that something that is fiction can be real in its power to move, to make a difference and to be important. I agree with Green’s view, this book is moving, well written fiction is moving, characters are moving. I have never been able to understand why people will try to say that the story of a character in a book or television series or movie cannot be as moving as a ‘real’ persons ‘real’ story. John Green has it in one, made up stories matter, and they can and do matter in a very real way. This story made me think about my own life, made me heartbroken for the characters and their families, made me think about the people in my life who had lost someone, who I had lost. This story brings people around the world together, it gives its readers pause for self reflection, and maybe it just entertains them. It’s still important. And just because the story is made up doesn’t make it insignificant. Thank you John Green for a wonderful book and to Jess for putting me onto it. Tell me about Paper Towns. I am interested in maybe reading more of his work. This is one of those books that I just cannot WAIT to read. I feel like my experience will be like yours...super emotional. I'm planning on reading it as soon as I get caught up...if that ever happens.